The Eram Garden or garden of paradise is one of the Tourist attraction in Shiraz. Many visitors, historian and poets have celebrated the Eram garden contributing to its universal prominent. The establishment of the Eram garden dates back to the Seljuk dynasty in 16th century. The refreshing air of this beautiful historic garden is due to its many old trees and particularly the famous 100 years old cypresses and due to the high plant diversity, it is used as Flower exhibitions every year. The architecture, carving, tiling and other architectural remnants of Eram garden have made a masterpiece for the Qajar period. Uppersia gives you the opportunity of a memorable and enjoyable travel experience in Iran in an authentic way. 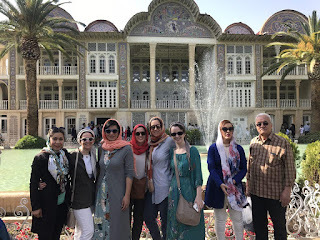 Also the knowledgeable and professional tour guides of Uppersia team, help you to uncover the hidden gems of Iran. A knowledgeable tour guide of Uppersia team accompanies a group of passengers to visit Eram garden.